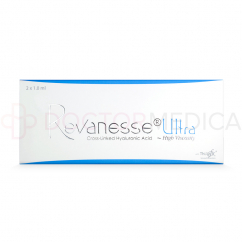 Buy Revanesse Ultra Online - Best Wholesale Price Discounts! 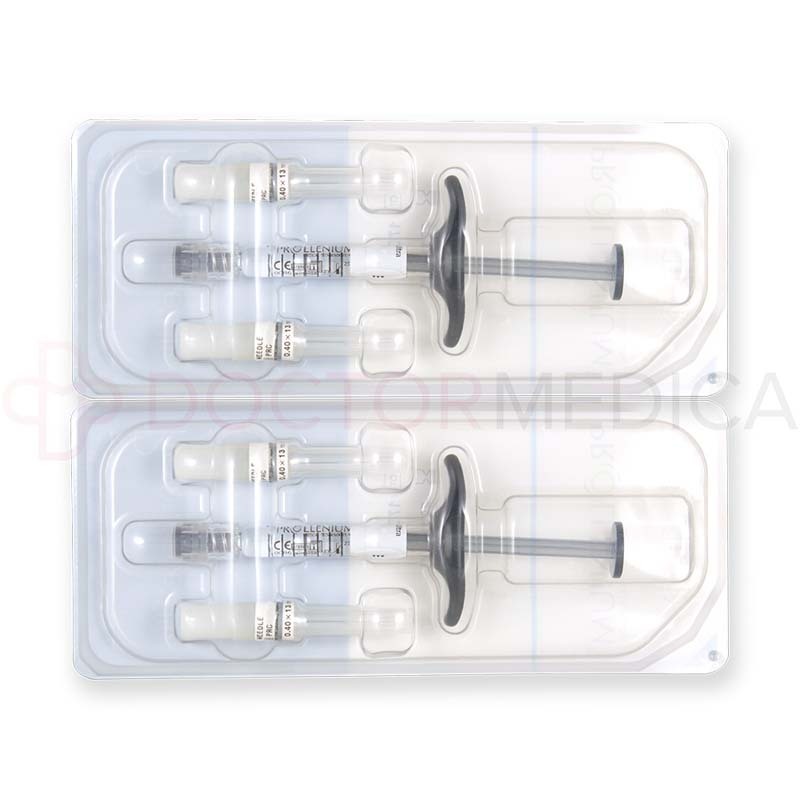 Revanesse Ultra comes with 2 prefilled 1ml syringes, 4-27G½” needles, and a product leaflet. 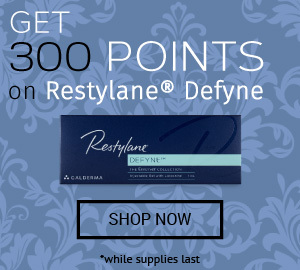 As a dermal filler from Prollenium, Revanesse Ultra offers great benefits for aging skin. Generally, it works to fill out deep lines and improve facial volume, restoring the skin’s youthful appearance. It works well for deep nasolabial folds, lines, wrinkles and oral commissures, adding volume from deep within the dermis. This thick injectable gel is comprised of 25mg/ml of high-viscosity cross-linked hyaluronic acid in phosphate buffered saline. When injected into the dermis, this formula’s hyaluronic acid binds to water molecules at the cellular level, adding volume and hydration. With this, the overlying skin is plumped and smoothed, creating a younger-looking complexion. What’s more, Thixofix Technology cross-links the hyaluronic acid particles, creating a stronger overall formulation whose results last longer within the body. 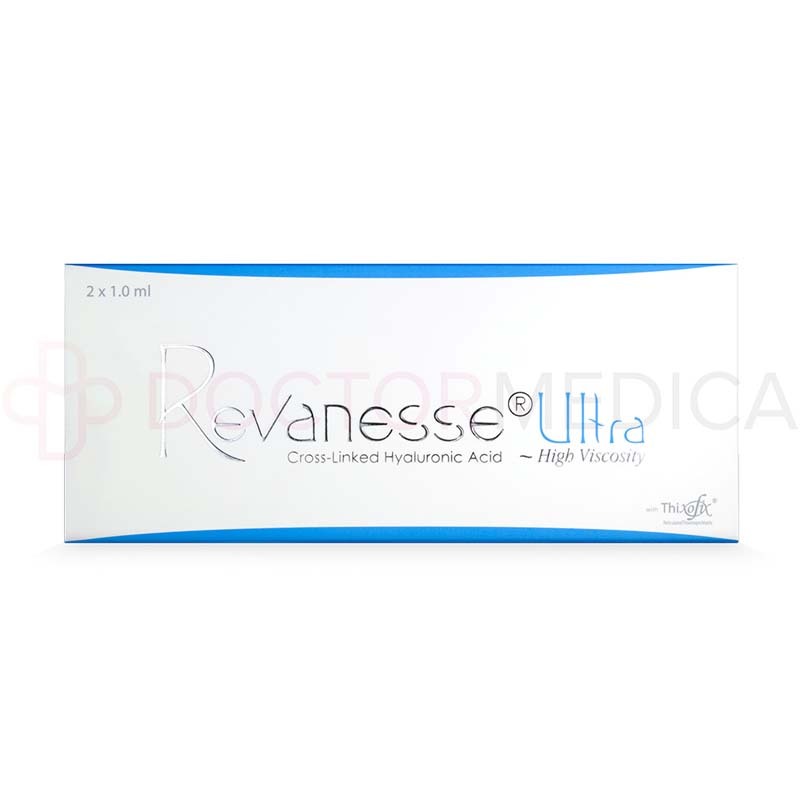 Revanesse Ultra helps to reduce the overall visible signs of aging, which come in the forms of volume loss, dry skin, forehead wrinkles, crow’s feet, periorbital lines, and glabellar lines. This dermal filler helps to add volume and correct deep wrinkles. It also moisturizes cells deep within the skin, delivering moisture where it is needed most. Altogether, this gives the skin a smooth, youthful look that can’t be achieved with other products. Revanesse Ultra is a medical device, and as such, may only be administered by a licensed health-care provider. Additionally, strict aseptic guidelines must be followed before, during, and after the injection process to reduce the occurrence of infections and unwanted adverse effects. Revanesse Ultra is easy to inject, which makes the process comfortable for both patients and doctors. It should be injected into the mid or deep dermis with the use of the needles provided in the product packaging. After injection, the injection site should be massaged to ensure that the gel conforms properly to the underlying musculature. Patients are advised to undergo this treatment twice a year to maintain the results. Revanesse Ultra is an incredibly speedy and efficient treatment, taking about 30 minutes to be administered. Revanesse Ultra can be used to reverse the signs of aging in mature skin. When it is injected into the dermis, it holds great amounts of moisture, providing volume and hydration to the skin. This helps to smooth the overlying skin, eliminating visible wrinkles, dryness, and fine lines on the face. And other deep wrinkles and folds. Revanesse Ultra lasts for 6–12 months after treatment. 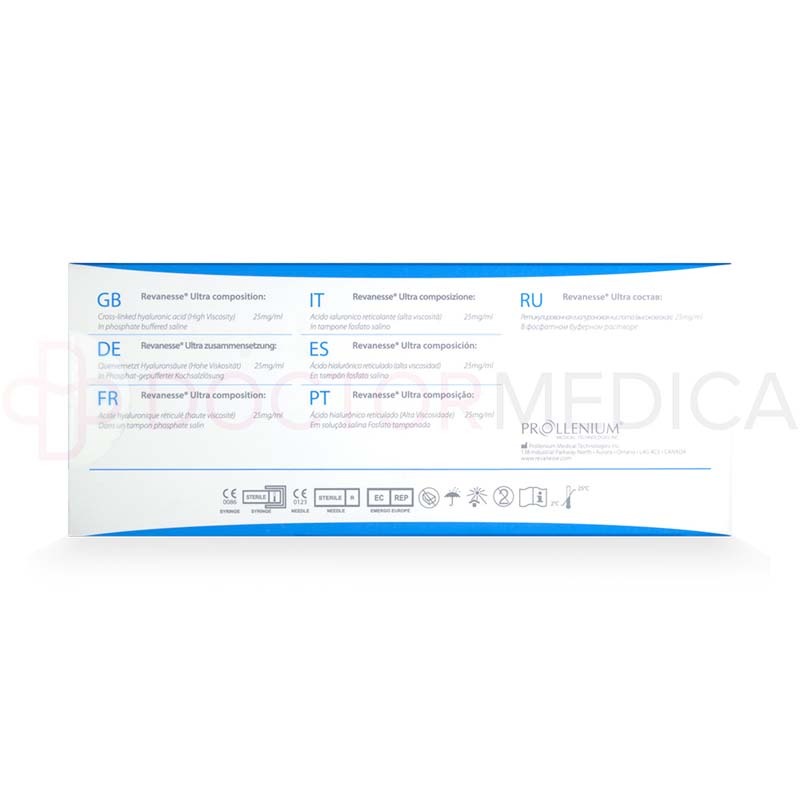 The duration of the effects of this dermal filler will depend on the patient’s age, the amount of filler injected, the injection site, and the degree of correction required. Revanesse Ultra helps to efficiently and quickly reduce the facial signs of aging. Upon injection, it increases facial volume, reduces wrinkles, and hydrates the skin—all with long-lasting, natural-looking results. Doctor Medica makes it easy for licensed medical professionals to offer Revanesse Ultra to their clients. On our site, we provide genuine products at the lowest prices we possibly can. Plus, with our variety of shipping and purchasing options, we simplify your ordering process for a totally hassle-free shopping experience. Revanesse Ultra is intended for adult patients who are looking to fix the visible signs of aging on the face. This dermal filler adds deep hydration to the dermis, helping to increase facial volume, reduce wrinkles, and add lasting moisture. Certain patients, however, should not use this product, including children and pregnant and breastfeeding women. Additionally, individuals who are allergic or hypersensitive to any of the ingredients in Revanesse Ultra should not receive these injections, as this may result in anaphylactic shock or other serious side effects. 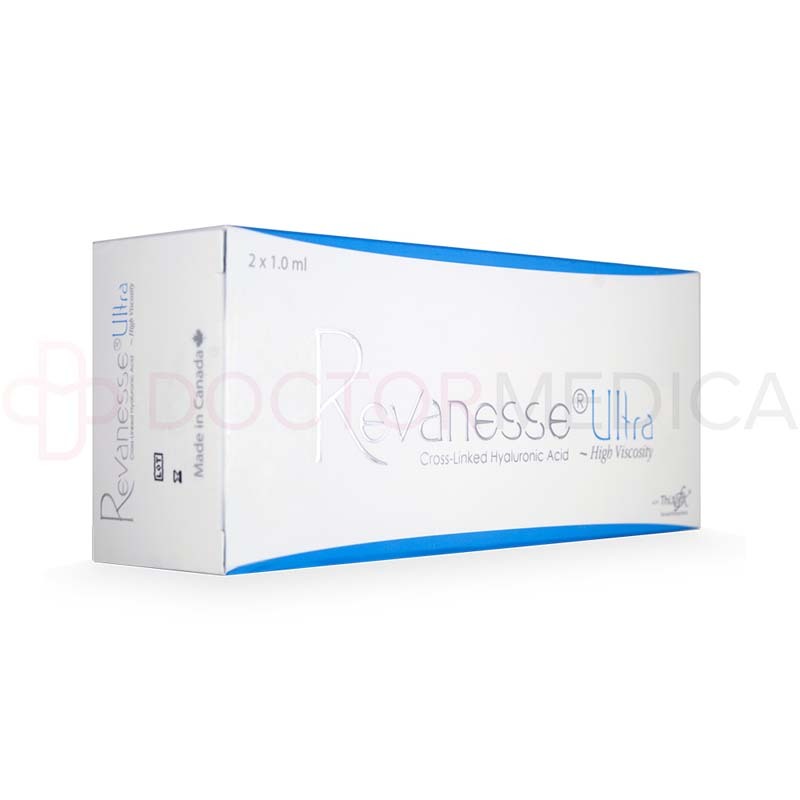 The side effects of Revanesse Ultra are generally mild in nature and should resolve themselves within a few days after the injection process. These may include a variety of injection site reactions, including redness, swelling, light bleeding, bruising, and mild pain. If these issues become persistent, patients should seek medical attention. For a full list of side effects associated with Revanesse Ultra, please consult the included product leaflet.